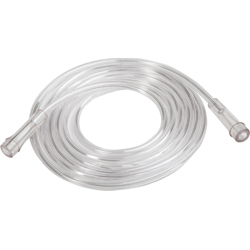 Roscoe Oxygen Supply Tubing has a six-channel inner lumen design providing uninterrupted flow of oxygen that provides maximum safety for the patient. When uncoiled, tubing lies out straight, minimizing "torque" or pull on the cannula. Roscoe Oxygen Supply Tubing has a six-channel inner lumen design providing uninterrupted flow of oxygen that provides maximum safety for the patient. When uncoiled, tubing lies out straight, minimizing "torque" or pull on the cannula. Our latex-free tubing is available in clear or a distinctive green tint color providing greater visual contrast for improved safety. Universal connectors at each end come standard. Available in a variety of lengths.